This is a fun one! 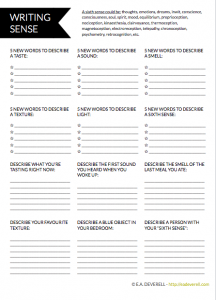 Description is an important writing skill to hone, and this worksheet will help you practice describing what you sense… and what you don’t. You’ll be sure to need some new words to complete this exercise. I recommend using OneLook and searching for words using the format: *:WORD. For example, *:smell. P.S. 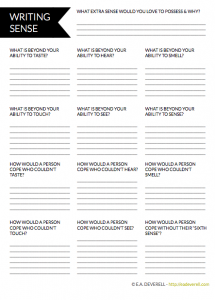 You may also like the mind & body worksheet.